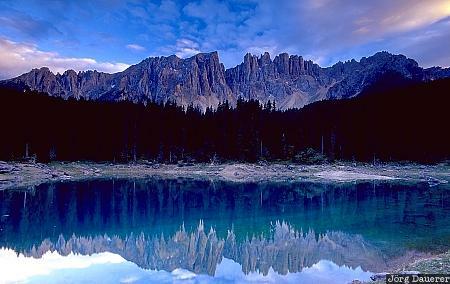 Reflexions of the Latemar group of mountains in the Lago di Carezza (Karersee) in the Dolomite Alps. Lago di Carezza is in the province South Tyrol (Alto Adige) in northern Italy. This photo was taken in the evening of a sunny day in September of 2001.